The biggest race of my career – the Ironman World Championships in Kona – is just a few days away. It has taken 3 Ironman races, 3 Ironman 70.3 races and almost a year and a half of injury-free training consistently to get to this point. I have to admit: once I qualified in July, it was really hard to wrap my tired brain and body around yet another Ironman training build. I ended up taking almost 3 days completely off, hiding myself from any outside stimulus. This reboot did the trick. I came out of my hibernation ready to rumble and ready to put my team into action to get me to the Kona start line as fit as I’ve ever been. Part of being a good athlete is recognizing your weaknesses and asking for help. This can be a rather uncomfortable place for many type-A folks. Since I can remember, I have had the (admittedly flawed) mindset that asking for help IS a weakness. I’ve had a lot of work to do in this department. This summer I finally recognized that I needed some guidance with my run training. 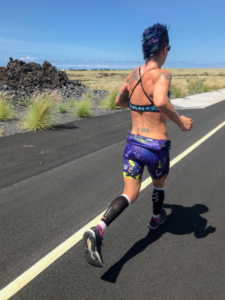 I was confident providing my own training when I was only racing the half Ironman distance, but the full Ironman is a much different ball game: I found myself going into each training block unsure if what I was doing was enough or the most efficient. So I made a short list of coaches I hoped to work with and was thankful when my top-pick, Lisa Bentley, agreed to join my motley crew. If you have never heard of this Canadian Ironman legend and multiple hall of famer, I encourage you to pick up her new self-published book, An Unlikely Champion. I dare you not to be inspired by all that she has accomplished despite significant adversity. One of the first stories I heard of 11-time Ironman champion Lisa, was when she raced three-quarters of an Ironman with a burst appendix. Did I mention she also has cystic fibrosis, a genetic lung condition? Yeah, talk about more badass than most. Keeping my run volume the same, Lisa incorporated a lot of strengthening hill repeats and solid runs off the bike to try and replicate the fatigue of the last 10 km of an Ironman run. Another key thing I’ve done to help keep my feet healthy is to rotate through several different styles of Topo shoes, with varying amounts of cushioning and drop. I also mix up the terrain. All combined, this approach keeps my limbs and feet stimulated, and thus conditioned to tackle a wide range of conditions. Another aspect of my race I wanted to optimize was my mental game. One of my strengths is already mental fortitude (like being able to finish Ironman Frankfurt with food poisoning!). 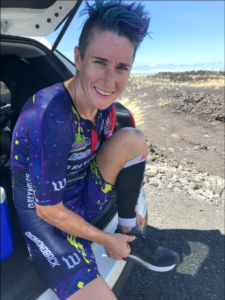 It is very well known that one of the biggest challenges of Kona is the heat. Of course, there is the physical side of preparing for the heat that I am doing – with sauna time and training in hot temperatures – but I know I can really feel mentally bogged down when the fatigue hits and temperatures rise. I had the incredible opportunity to connect with high performance psychologist, Dr. Jason Brooks, based in Winnipeg, MB. Together we have been working together to help me focus on embracing the challenges instead of fighting them. He’s helped me gain a different perspective on adversity and understand what it means for me to have a beautiful race, outside of specific times or placing. Lisa and the rest of my team have also been wonderful at helping me stay positive throughout this final build. I am able to focus on the incredibly consistent training I’ve had in this last block and some very strong last-key workouts that give me all the confidence I need to know I’m able to hit the start line in the mix with the best. As athletes, pro or amateur, we are never stepping on that start line without a team of people who have helped get us there. I am so incredibly grateful for these game changers in my career. I hope to make everyone proud with the race of my life on Oct. 13. 1. Embrace adversity; don’t fight it. 2. Take time pre-race to list those key workouts or races that will give you confidence on race day; don’t dwell on those that will not. 3. On the course, break your day into smaller chunks; Terry Fox broke down his run of thousands of miles across Canada into getting from one telephone pole to the next. Have questions for me? Tune in to Topo’s Instagram Stories on Thursday, 10/11, at 9 a.m. PT/noon ET where I’ll be hosting an ask-me-anything session! Rachel, a.k.a. “The Purple Tiger,” is a professional triathlete training in Vancouver, B.C. 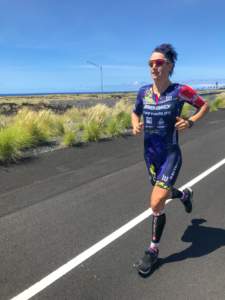 She has been racing full-time as a professional triathlete since 2011, but is also an accomplished cellist and a board-certified genetic counselor with two graduate degrees! 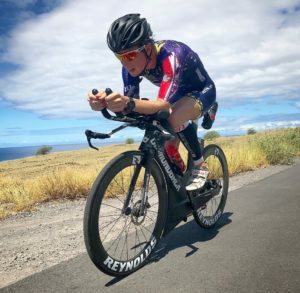 Follow Rachel’s journey to Ironman Kona and beyond online at rachelmcbride.com or on social: @rachelmcb on Instagram, @Rachel_McB on Twitter and @RMcBrideRacing on Facebook. We’ll also be posting live updates on Topo’s Instagram Stories throughout the event!